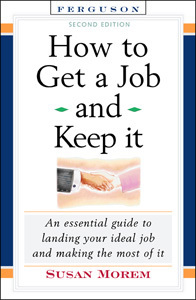 This edition of the popular step-by-step career guide by nationally recognized career expert Susan Morem tells job seekers and recent graduates everything they need to know to excel in the workplace. Gathered here is all the key inside advice—on navigating the job search process, landing the ideal job, handling life on the job, and getting the most out of a career—that readers won't get in a classroom, from parents or friends, or from a guidance counselor. This edition has been expanded with six new chapters and a listing of useful resources. Helping readers understand the realities of the working world, How to Get a Job and Keep It, Second Edition gives them a valuable edge over the competition and helps new workers make a successful transition to the professional workplace. Knowing when to leave a job and doing it gracefully. "An update of a valuable guide...Morem covers all the basics succinctly and clearly, with enough detail to engage readers...A worthy addition to most collections." "Teens just getting started in the job-seeking process will find Morem’s advice useful..."
"Excellent ideas...Organized in a very detailed format...the text is very informative and well organized...helpful..."